The video footage also shows the damage done by the bomb which killed eight people. CCTV FOOTAGE OF Anders Breivik parking his van and walking away at the scene of the explosion that killed eight people in Oslo last year has been released for the first time. The images feature in a video which combines live CCTV images with a reconstruction of the events leading to the explosion and was published by Norway’s public broadcaster NRK. Breivik is seen parking his white van outside the Prime Minister’s office building. He then gets out of the van in a security guard’s uniform and walks quickly away from the scene. The video, which features comments from the on duty security guard on the day, also shows different angles of the time of the explosion and the damage caused by the bomb. The prime minister was not in the building at the time, though eight other people were killed in the blast and several others were injured. 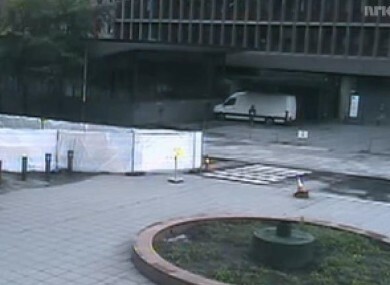 Email “CCTV footage shows Anders Breivik parking van at explosion scene”. Feedback on “CCTV footage shows Anders Breivik parking van at explosion scene”.